June is a big month for Family Support Hawaii’s Fatherhood Initiative as it joins the rest of the nation to celebrate Father’s Day. 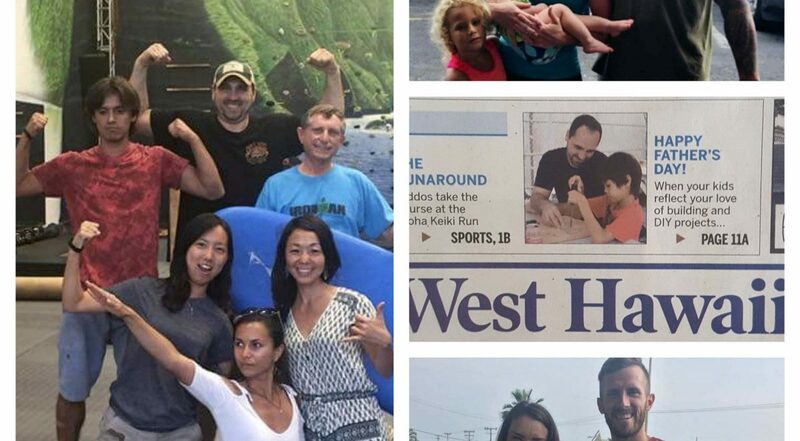 The Fatherhood Initiative co-sponsored two local events in June that brought together families in celebration of our community’s fathers: one was a partnership with Hawaii Action Academy and Trunk Trainers (a tailgate party) and the other was a partnership with Habitat for Humanity (a DIY workshop). The tailgate party was a huge success attended by about 100, including fathers, partners and their children. We provided food, of course, and also an obstacle course, a Potagee Horseshoe toss, a Bouncy Castle, and health screenings. One lucky dad won a brand new three-burner gas grill while other dads won an assortment of other prizes. The winners in each age division for the horseshoe toss walked away with a brand new Potagee Horseshoe kit, while others got movie tickets or free memberships at Trunk Trainers. The DIY event was hosted by Habitat for Humanity at three Big Island locations: Kona, Waimea and Hilo and was sponsored by an award from The Hawaii Commission on Fatherhood. There were two opportunities for dads to build something with up to two children each. The morning session produced racks for barbecue tools. Fathers and their children put all the pieces of the racks together, stained and painted them, and installed hooks. Each dad got a brand new set of barbecue tools to go with their finished racks. The afternoon participants created a wood photo transfer; dads and their children glued a large photo onto wood, let it dry, then slowly rubbed off the photo paper with a sponge and water. The end result was a vintage-looking photo with a wood backing. Both projects were easy enough for the kids to do with the help of their dad, the way it was meant to be! Events like these bring families together to celebrate dads and re-affirm that dads matter. What a great opportunity to see what healthy fathering looks like in action.